can browse true to get the some prospective. 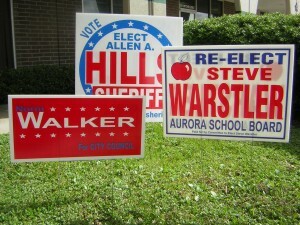 Political signs are a common sight throughout the year during upcoming elections. These great yard signs you see across town everyday help put your name out there for potential voters to see. The best part about these amazing plastic signs is that they really do work! Think about it, with so many people driving, walking, jogging, or driving about in their everyday life they are bound to notice the political yard signs, especially if the color and the message stand out. You can spread your message, slogan, and candidacy to a whole variety of different people with different backgrounds. This will make people curious and ask themselves, Who is this person? Why are they running for public office? What is their intent? This curiosity will make people do a little research on you and find out more about your political. A lot of people push for internet advertising, which is great but you also need to reach the potential voters that don’t frequent the internet as much as other people do. Think about what you would spend on advertising if you were to use television, newspapers, or radio ads, these forms of advertising are more expensive and time consuming, not to mention stressful. 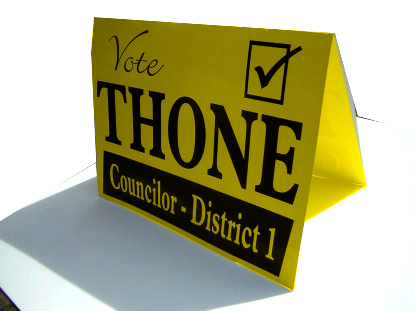 Election signs are without a doubt the fastest and easiest way to get name recognition and to reach out to voters. Lawn signs are an important and essential part of an election political. When used properly yard signs are very effective in getting your name out to voters and according to Political scientist Mel Kahn, lawn signs help build name recognition for Candidates. Lawn signs have been known to make a longer impression on potential voters, especially towards the latter days of the campaign. Two main key points that will make yard signs more noticeable is the color and shape. Using a different shape than then commonly used rectangular and using different colors than your opponents will surely make your signs stand out more and have a longer impression. When placing yard signs around town, the best ways to put them are at busy intersections, near parks, and school zones. A larger quantity of signs express the enthusiasm that supporters will have in favor of a particular candidate. Asking family and friends to put up signs on their lawn is a great way to get your name familiar with the neighborhood and with potential voters. However, beware because some local governments put restrictions as to size of signs and the location of where they can be placed. 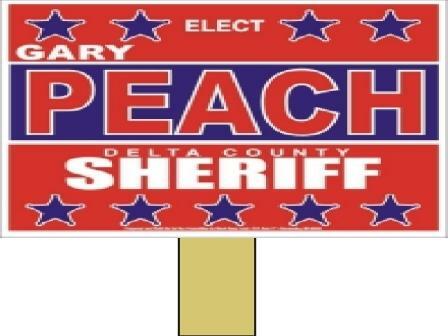 Order professional yard signs for your successful political campaign. political posters, political posters, and yard signs are offered at the lowest price with superior customer service . Political campaign yard signs are an ideal choice for any political campaign. We specialize in corrugated political yard signs. Yard signs are now more affordable. If you are looking for a cheap advertising to boost your campaign. hi quality cheap political plastic yard signs for your campaign. Inexpensive campaign products and signs. selection for campaign signs and political yard designs we offer. Cheap political signs for your Campaign victory. Lawn signs generally contain the name of the candidate, their party, and the office for which they are running. paid for it, but it is usually in small text that is much less noticeable. This notice is often required by campaign finance laws. The insignia for the sign maker or printer's union responsible for creating the signs is often seen in the same size type. The 30 MPH rule for candidates and businesses is important for the effectiveness of a lawn sign campaign. that on roads that have speed limits of 30 MPH or less, a small 'lawn sign' is best. be about right. But when speeds exceed 30 MPH, then larger lawn signs are needed.